Following yesterday’s indecisive trading which ended in a small doji cross candle the euro vs dollar seems to be on the move in the London session as it once again begins to probe the USD1.25 price handle, a key support area if the euro is to have any hope of reversing from its present downwards path. However, today’s short burst of activity is against the backdrop of the Ascension Day holiday in Europe which can result in lower volumes & erratic price action. The price action is also against the news that Spain, Portugal & Italy are all beginning to take austerity measures in an effort to decrease their debts and restore a degree of confidence in the Euro project. In addition futures volume & open interest in the euro has never been more extreme and in trading such extremes can often be a strong signal that the major trend is about to turn. 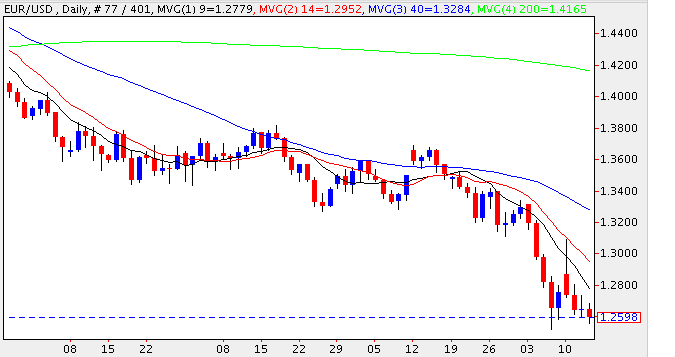 From a technical perspective the key level remains at USD1.25 and should this be broken in any significant way then expect to see a further substantial drop, possibly to re-test support in the USD1.20 region. However, given the above scenario and, in particular, the futures’ market which is now beginning to signal a potential turning point extreme caution is required in opening further long term positions to the downside. Any existing short positions should be fully protected with trailing stop losses tightened as the market lower to lock in potential (or existing) profits should there be a rebound from this technical level. 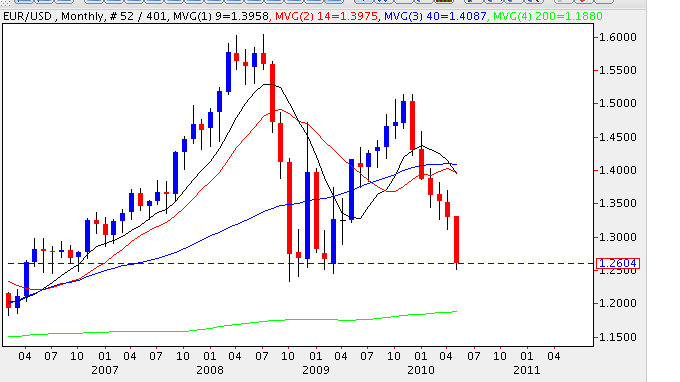 Looking at the longer term charts and, in particular the monthly, this clearly indicates the various well defined levels of support with USD1.20 combining with the 200 moving average which is a pivotal level.